Two years ago, I found this little tree in the remains of Walgreen's Christmas markdowns. I decided it would be my "act of green" for the day to rescue her. Sold as "living Christmas trees," these plants are actually called Norfolk Island Pines, but that name is a little deceptive. 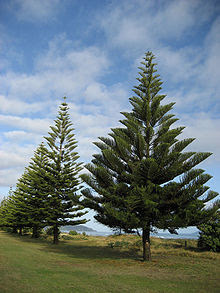 The Norfolk Island Pine -- Araucana heterophylla -- is not native to the United States. And, it's not really a true pine. What it is is a conifer -- a cone-bearing plant that produces seeds instead of fruit. What distinguishes a pine is the way its needles grow. A true pine has needles that grow in clusters of two - five, while the needles of other conifers and evergreens grow individually, directly out of the branch. True to its name, the plant is endemic to the Norfolk Island, located in the Pacific Ocean between Australia, New Zealand, and New Caledonia. In its native habitat, the these trees can grow up 200 feet tall. In the United States, Norfolk Island Pines can be found growing in southern Florida where they can grow to a height of 50 feet. They can also be found in California, where they can grow to be 100 feet tall. As houseplants, however, their growth is limited by the size of their pots. Indoors, the Norfolk Island Pine requires temperatures of 60-70 degrees Fahrenheit. It needs about two hours of direct sunlight each day. It requires water when the top inch of the soil is dry. Optimally, the Norfolk Island Pine likes 50 percent humidity, and that can be a challenge. However, my plucky little specimen has done just fine residing in my kitchen. If you have an opportunity to "adopt" or "rescue" a Norfolk Island Pine this holiday season, do so. It will give you pleasure for years to come -- and it counts as an "act of green." And that's ecofeminism in action. Learn more about caring for a Norfolk Island pine courtesy of Purdue University, at Purdue Yard and Garden.